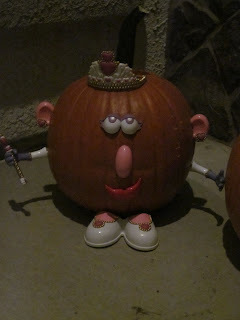 It seems like most our blog posts so far this month have been leading up to one special event....HALLOWEEN! Yes - today is the day....the day Zach understands that if he goes "trick-or-treating" he gets candy...the day we get to "play" with more pumpkins...the day our kids get to hang out with their cousins in California! 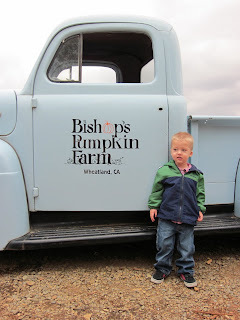 Remember those HUGE pumpkins we picked out the day before at Bishop's Pumpkin Farm? We decided to carve them in the backyard of Jen's parents house - the weather was upper 70's and perfect. 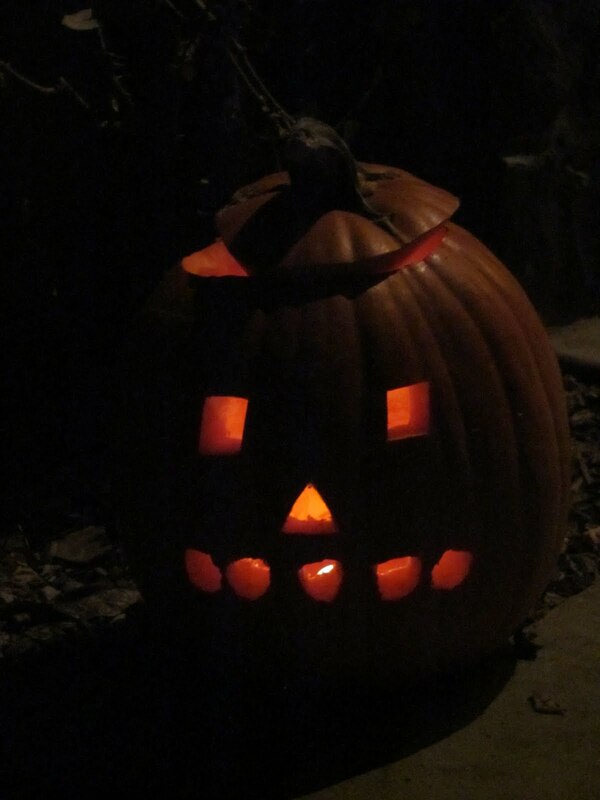 The adults carved and the kids played. Logan was having fun just chilling in the "pink" walker watching his brother and cousin run around and watching all of the adults carve some pumpkins. It started to get dark and that was the signal to get ready for TRICK OR TREATING! 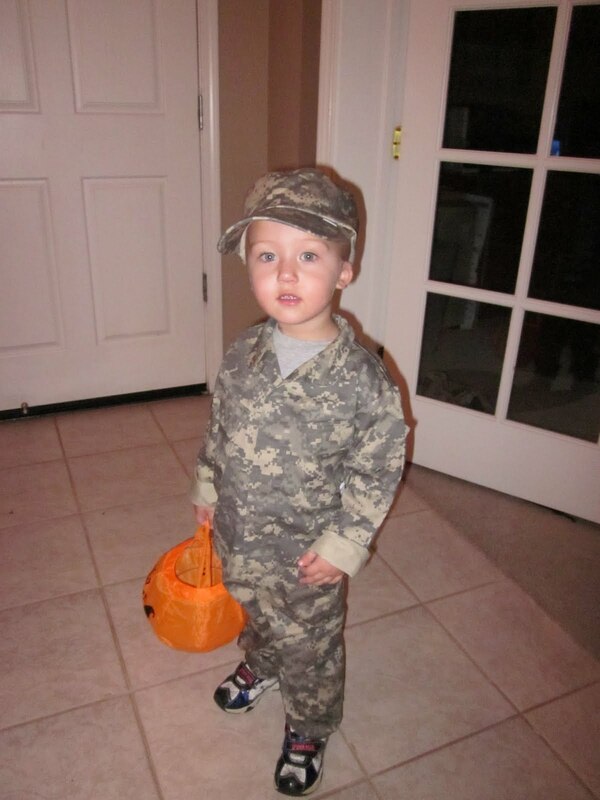 We had been struggling to get Zach to wear his Army man costume prior to Halloween - he wouldn't wear it at daycare or for his preschool Halloween party. We were really worried he wouldn't wear it on the actual holiday...but he didn't put up any fight to wear it this evening! Here is our little Army man! 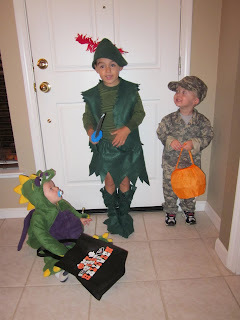 Here is a picture of Logan (dragon on the floor), Scott (Peter Pan) and Zach all excited and hyped to go trick or treating. Here is a picture of London - the biker chick! After the first couple of houses they kids got the hang of it....they were even comparing candies and handing them to us to open so they could eat them! Little Logan didn't last long. He had been fussy (those darn teeth trying to come!) and we gave him some Motrin relief, about 30 minutes into trick or treating he totally passed out asleep in full costume. Jen took him back to her parents and changed him out of his costume and into his pajamas and put in to bed all while he was still asleep! 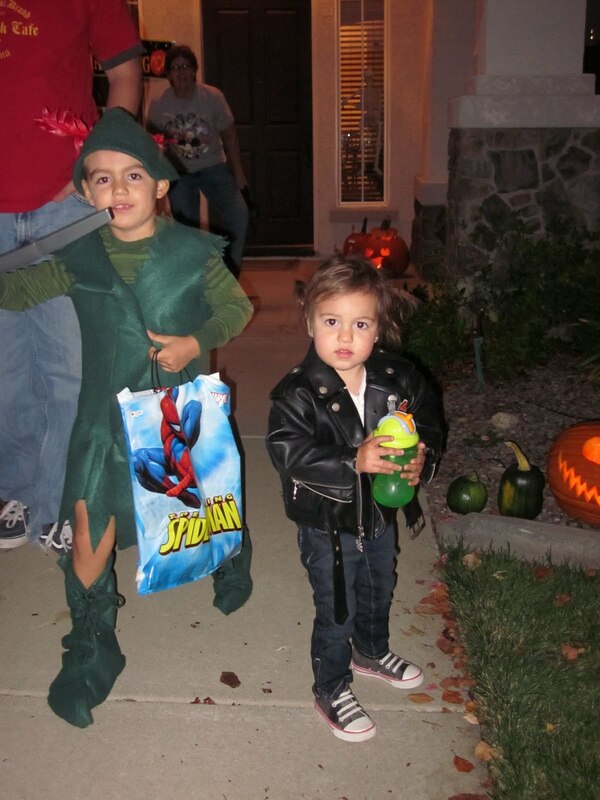 So here is the best picture of Logan we got all night...and of course his Halloween candy stash! Now this is about the time the trick or treating got serious. The kids hit up every house they could find with someone home. Zach's candy bag was overflowing...it took some hard convincing to get him to empty some of in into the stroller...he didn't want to lose any of that candy! Here are Zach and Scott in action! After about an hour and a half the kids were tired. Zach even told us his feet didn't work any more and started tip toeing around...but kept saying "just one more house, just one more house". Once he finally agreed to go for a ride in the stroller we knew he was done and headed back to Grandma and Grandpa's. And when we did get home we had to lay out the candy stash......he was pleased. Finally...here is how our pumpkins turned out! While we were in California we took the kids to a park Jen remembers going to as a kid. 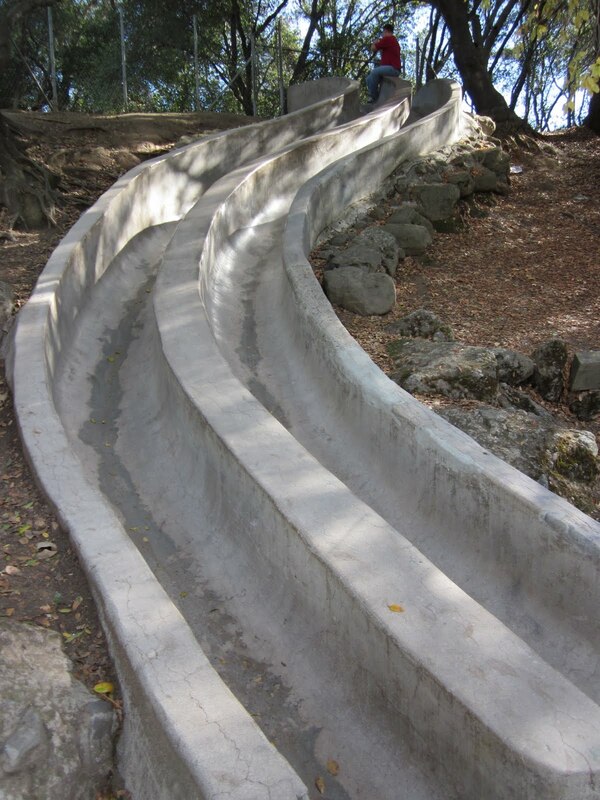 We always called it the "cement slide park"...because there was a cement slide built into the hillside! We use to take wax paper and go down the slide super fast. 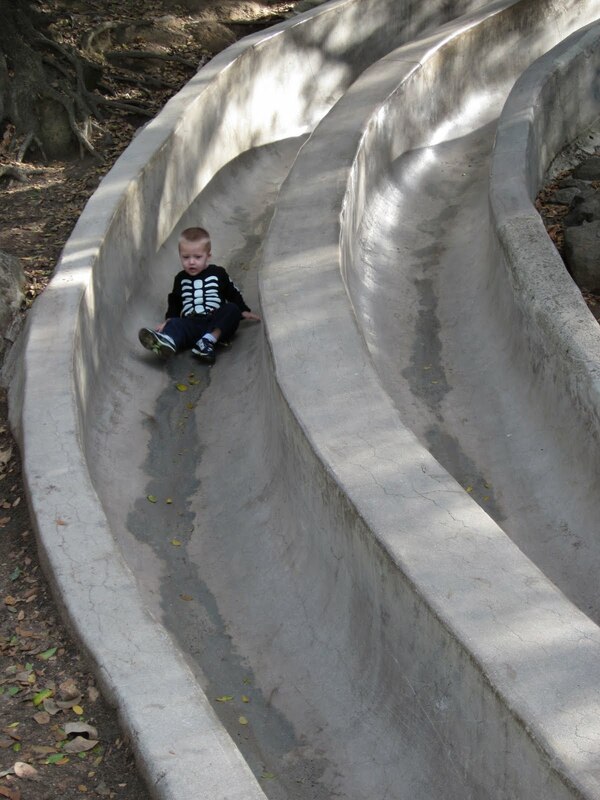 The slide isn't as "fast" anymore....here is Zach trying to go down. The one downside of a cement slide is if you hit your head....it is cement...Zach hit is head and started to cry. We found this lizard on the side and it DID NOT cheer him up. 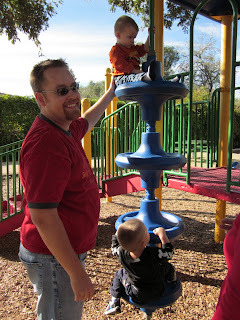 We decided it was time to stop playing on the cement slide and check out the rest of the park. Logan enjoyed the swings. 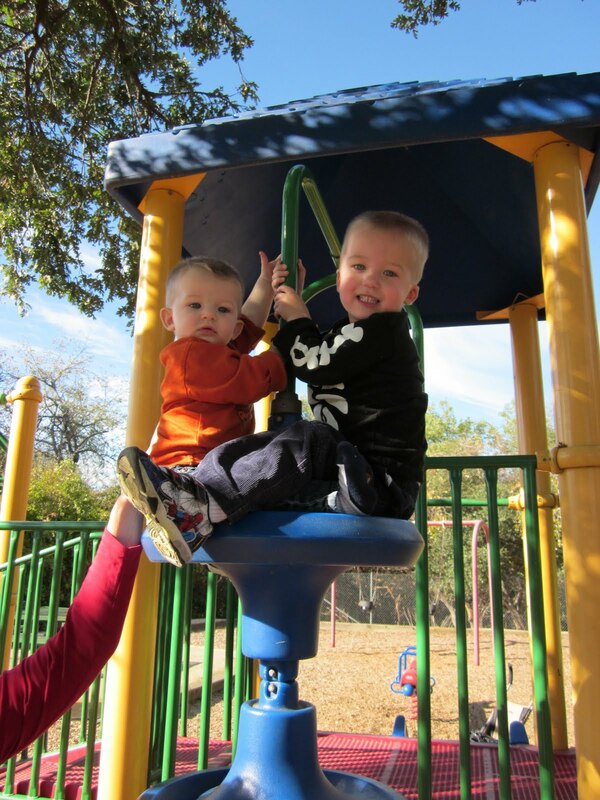 The kids both climbed the playscape with Dustin's help. Believe it or not the kids were "nice" to each other while on this beast! The weather had been rainy off and on all day and when we arrived at the pumpkin farm we could see the clouds start rolling back in. We decided to pick out our pumpkins first before it started to rain again- this facility had much more activities to do besides find pumpkins. 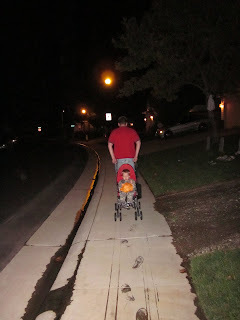 We got super excited because people were hauling around pumpkins that were HUGE....Zach wanted to of course pull the pumpkin cart. This is someone else's pumpkin Zach saw sitting on a cart and he decided he wanted to try and pull it. The owner was just kind of looking at us funny - we didn't realize it was actually someone else's pumpkin we thought it was just a display! Then we took a tractor pulled hay ride out the field to pick our pumpkin...right off the VINE! They had THOUSANDS of pumpkins still growing the DAY BEFORE HALLOWEEN. Zach went around trying to lift every pumpkin he could. Finally he found one that he COULD lift...and he decided that was HIS pumpkin. We didn't have the heart to tell him the reason the pumpkin was green was because it wasn't ready to be picked....we just let him enjoy having a green pumpkin this year! Boy was he proud he could carry it around. Here is a picture of us with our pickings. See Zach's green pumpkin? 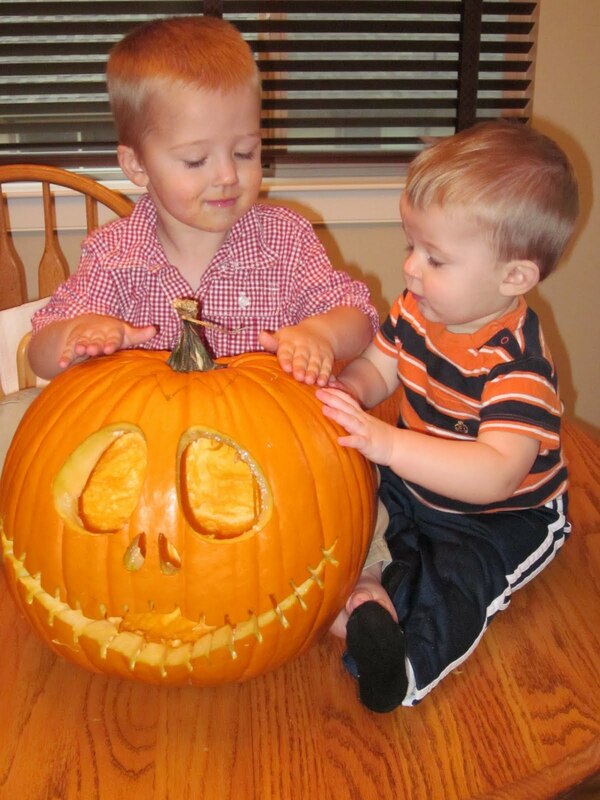 Zach is sitting on Dustin's pumpkin too. ...another baby green pumpkin...smaller than his...for his brother Logan! 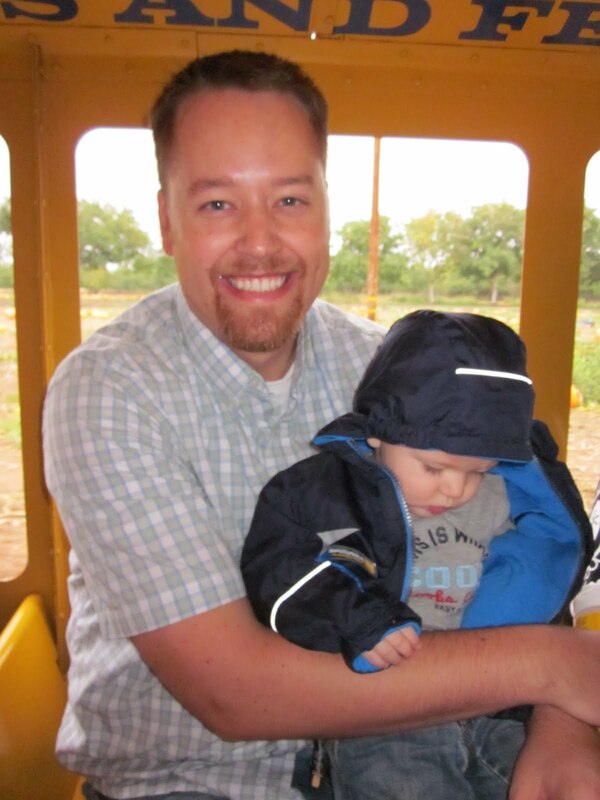 On the tractor hay ride back to the car area we had someone else take this picture of us. I think it turned out really good! We bought our pumpkins and got our "own" pumpkin hauling cart and took it to the car. After the car was loaded with our pumpkins - Logan decided to wake up! So now we all were able to enjoy the rest of Bishop's Pumpkin Farm....for about 30 minutes and then it decided to start raining again. We loaded everyone up on the train and went for a choo choo ride. Zach rode with his Grandma and Grandpa Twogood, Logan rode with Dustin and Jen. We decided we had enough and hit the road...with some KILLER PUMPKINS! Logan is 10 months old! 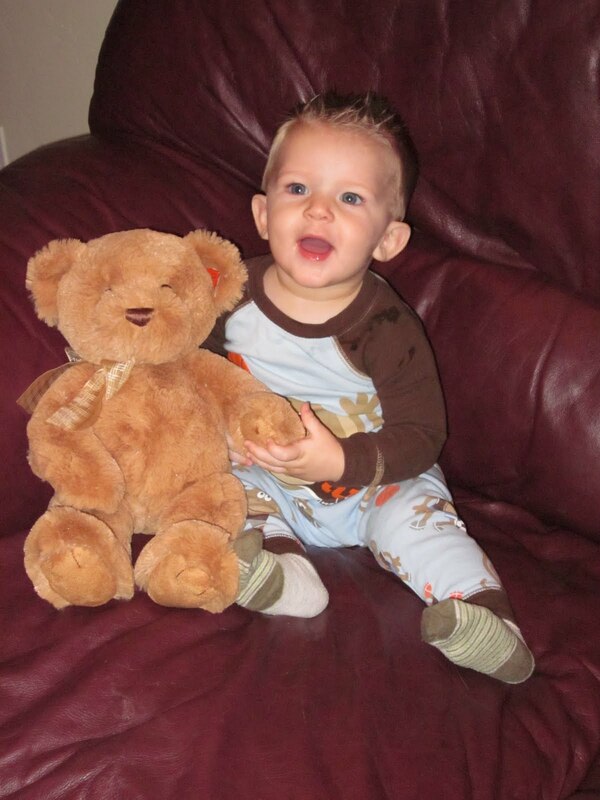 Time is really flying.....Logan is TEN MONTHS OLD!!! 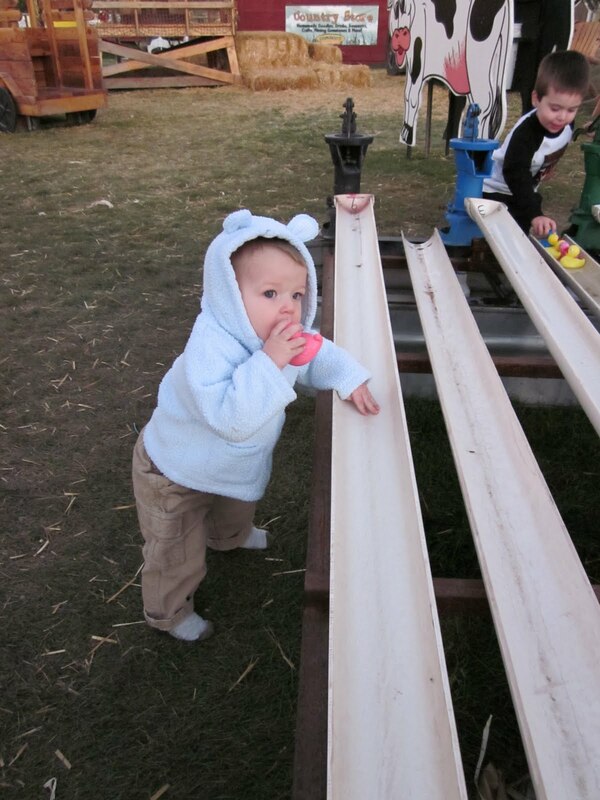 Logan is crawling up a storm, he can even stand on his own for a second at at time. He FINALLY is sleeping through the night - thank goodness....we thought we were going to go insane from lack of continuous sleep! We think those teeth are getting close - his bottom gums are really swollen. Logan also eats everything in sight! He hardly eats "baby food" any more, he wants the real stuff. To get a bit more into the Halloween spirit this weekend Jen decided to do some sugar cookie decorating with the kids. Zach loved doing the sprinkles and Logan liked eating the cookies. 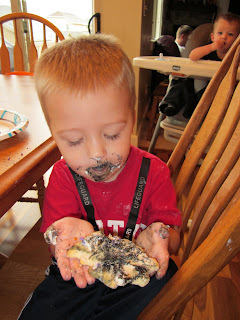 The black sprinkles were a hit with Zach, he just kept dumping them on his bat cookies. 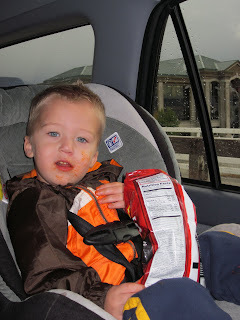 We were laughing when we told us he was "done" eating his bat cookie because this is what he looked like! 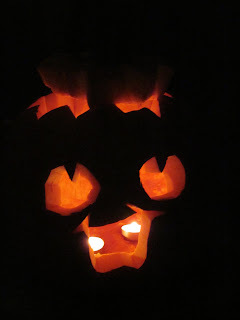 This is our last "free" weekend before Halloween - so we decided to carve one of our pumpkins! 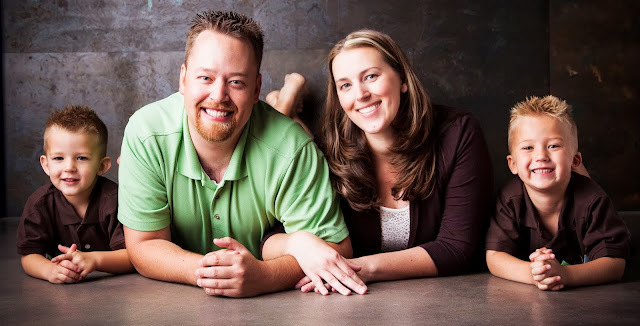 Dustin and Jen looked at some designs and picked out a good one. Dustin did the carving and the kids had fun checking out what we were doing and finding ways to help us out. We think the finished product turned out pretty dang GOOD! Logan has also decided he is officially the KING of the dishwasher. Anytime he sees you headed towards the dishwasher he follows you...so he can do this! Yup - we love them BOTH! 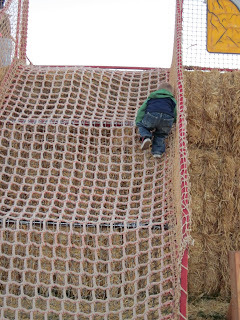 It is that time of year again - our adventures at Cornbelly's. 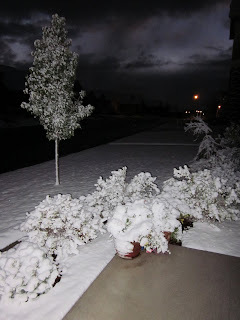 This year we had a hard time picking the right "day" to go due to the weather in Utah deciding to speed up winter! We came home from work and were talking about how nice the 70 degree sunny day was today and decided since the forecast called for rain and snow the rest of the week we should make tonight our Cornbelly's night for the kids. We ate dinner fast and loaded ourselves up into the car and made the 1.2 mile drive to Thanksgiving Point. The first thing Zach spotted as we paid to enter was a wagon. He HAD to have a wagon to pull, and we was perfectly content pulling Logan around in the wagon...so this is what we looked like most of the night! Next stop was the activity gym. 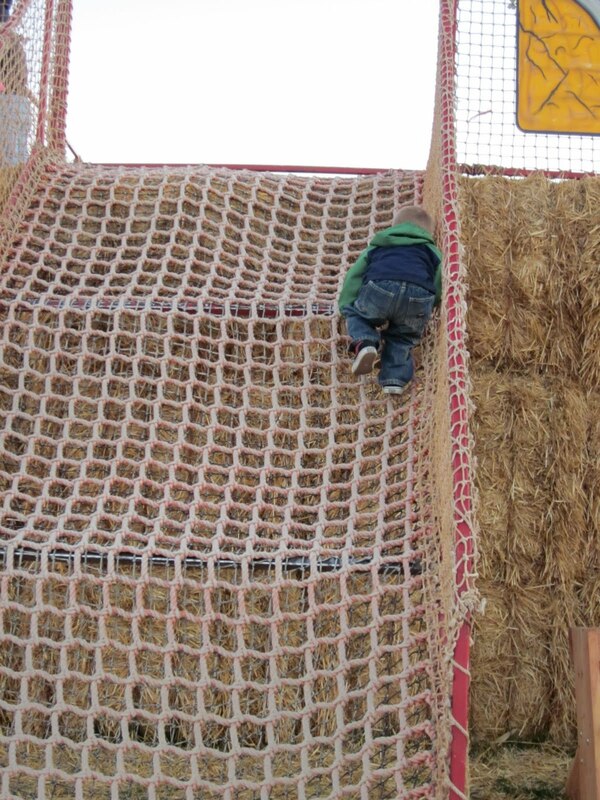 Zach just started climbing up the rope wall all by himself...and would do down the slides all by himself. 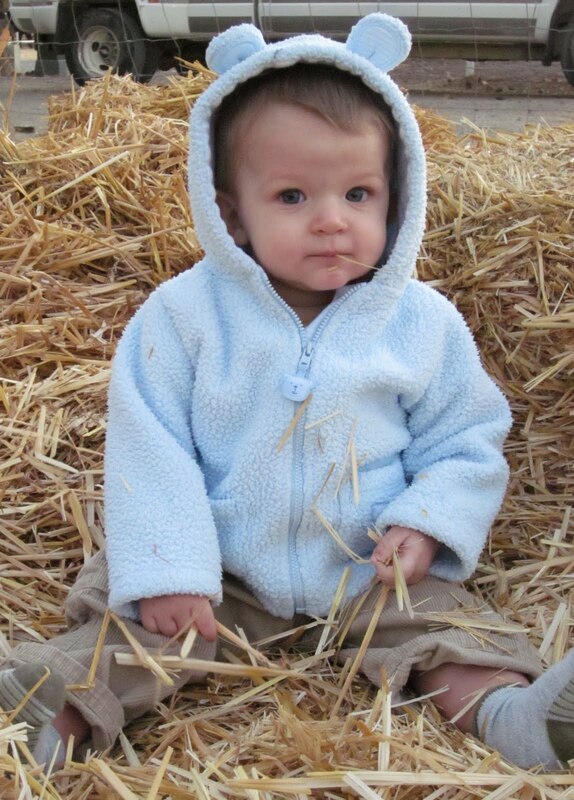 We had to wipe the single tear from our eyes because we realized our "baby" was all grown up. 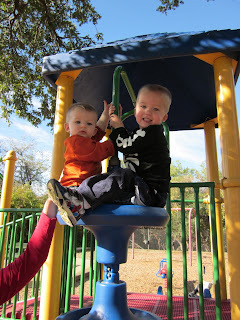 He can now officially handle playgrounds by himself - no assistance needed from mom and dad. No day is complete for Logan without "trying" new things...tonight it was HAY. By this time the sun was long gone and the wind started to pick up (remember that forecast about rain/snow for the rest of the week?). 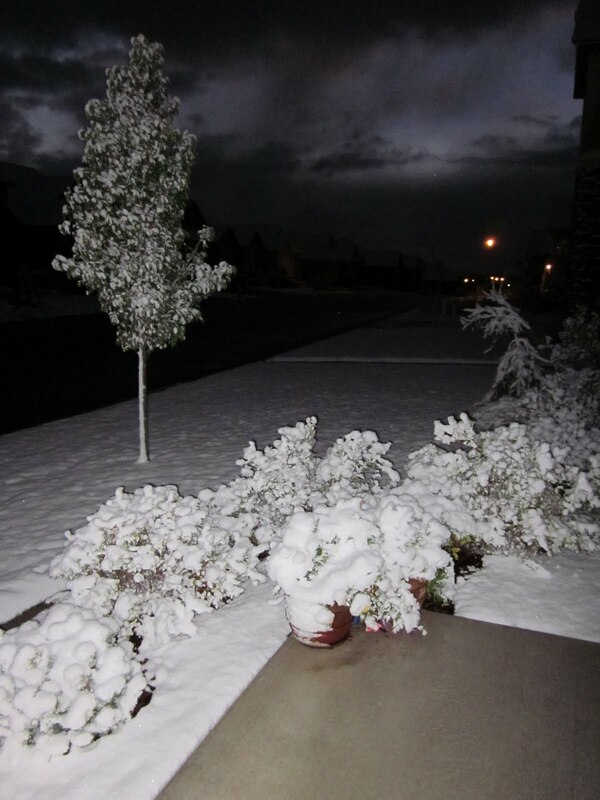 We realized the kids hands were a bit chilly and decided to call it a night. 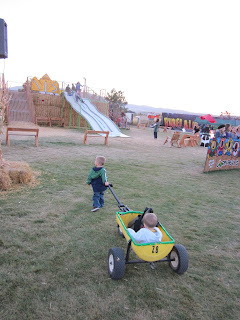 We didn't do the corn maze (not sure doing that for an HOUR with two kiddos would be "fun"), we didn't get to do the hay ride, we didn't get to watch the pig races, or shoot the pumpkin blaster...but at least we have something to look forward to next year! Oh - looking a this picture makes Jen realize she will ALWAYS be outnumbered and tractors will always win.